It’s soft and the colors are perfect. 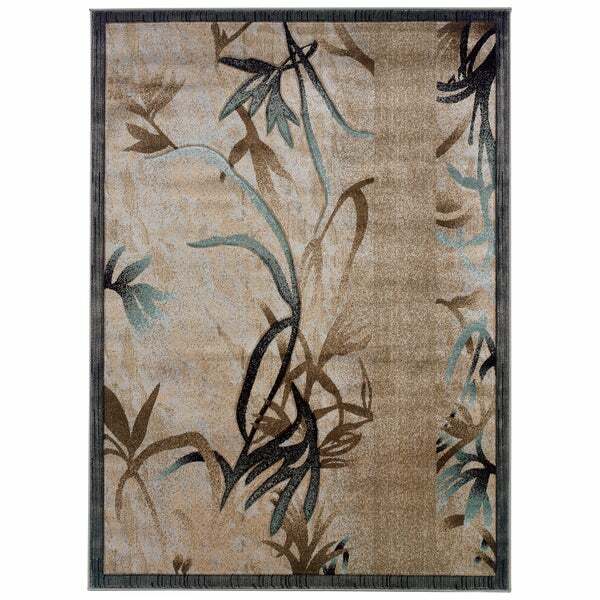 Linon Milan Collection Beige/ Aqua Area Rug (5' x 7'7) - 5' x 7'7"
Created from 100-percent heat set polypropylene, the Milan Collection is power loomed in Turkey. Featuring transitional designs and trendy colors taken from today's hottest fashion trends, the Milan Collection is sure to bring style to any room in your home. All the colors go great with the rest of the furniture. Ordered a few rugs, this is the best made one. Very plush and dense. Attractive. There are indented lines in several places give it some 3D life. Love this rug! Looks beautiful in our basement and offsets our furniture nicely. Took a few days to get it to lay flat without curling. I love the rug. Looks just like the picture. "Is this rug as dark in person as it looks in the picture? I like the colors as I have aqua in my curtains but I am afraid that the rug would be too dark because I have dark wood floors. Thanks." Hello NoleFan, yes the picture is very accurate. Please let us know if you have any further questions. Nina Vintage Bohemian Blue/ Orange Area Rug - 7'6" x 9'6"